Baked nectarines with port. Quite possibly the easiest—and booziest—dessert you’ll make all summer long. 1. Preheat the oven to 400°F (200°C) and position a rack in the center position. 2. Place the butter in an 11-by-7-inch (28-by-18-cm) or 9-by-13-inch (23-by-33-cm) baking dish and transfer it to the oven until the butter melts, 2 to 3 minutes. 3. Remove the baking dish from the oven and add the port, honey, nutmeg, and salt and stir to combine. Arrange the fruit, cut-side down, in the baking dish. Return to the oven and bake until the nectarines are just tender, about 15 minutes. Turn the nectarines over and baste with the juices in the dish. Continue to bake until the nectarines are very tender and have released some of their juices, 5 to 10 minutes longer. If you prefer the juices in the pan to be more syrupy before you spoon them over the nectarines, pour the juices into a pan and gently simmer until thickened. 4. Serve the nectarines warm with the juices spooned over the top alongside a big scoop of ice cream or whipped cream. I'll be making these baked nectarines with port again and again this summer! The nectarines at the store were less than inspiring, so I used 6 red plums instead. For the port I went with an inexpensive Sandeman Ruby port. I started by melting the butter in a glass 11-by-7-inch baking dish although I think a cast iron skillet would work well, too. After adding the honey, port, nutmeg (fresh) and salt, I pitted the plums over the dish to catch all of the lovely juices. The plums fit nicely with just a little wiggle room. I checked them after 15 minutes and flipped them at that point since the skins were starting to crack and the fruit was already quite tender. It only took another 5 minutes for the plum halves to start to "slump" and were clearly done. There was quite a bit of juice or syrup in the bottom of the pan and it was a little thin, so I poured it off and reduced it for a few minutes on the stove top before spooning it over the fruit. I served 2 warm plum halves beside a slice of pound cake and topped each serving with a scoop of vanilla ice cream. The remaining fruit was delicious the next day on some plain yoghurt with a sprinkle of granola for a brunch treat. Without the cake, you might want to serve 3 plum halves with the ice cream alone and count on 4 dessert portions. The fruity notes in the port nicely complimented the plums - I can't imagine a better combination - but I will certainly try this again when I can get some decent nectarines! I can envision this as a savoury side to roast port or duck too - perhaps cut back on the honey, add some balsamic vinegar for the acidity, and substitute rosemary for the nutmeg - the plums and port combo would be a total winner either way. Total time was approx. 40 min - 5 min to melt the butter and mix the syrup ingredients, 5 min to prep the plums, 20 min to roast, 5 min to reduce the sauce. Time well spent! Once the fruit was ready, the rest of the recipe came together in a jiffy and was in the oven before I knew it. I set the timer for 10 minutes less than the suggested time of 25 minutes because my fruit halves were skinnier than what the recipe was anticipating. At 15 minutes, I turned the pieces and began basting the fruit for the last 10 minutes but I probably could have just turned off the oven and let the fruit sit in the juices to finish. I felt my fruit was ready at the 15-minute mark. When the pan was taken from the oven at 25 minutes, the fruit was soft but not mushy so I would say the suggested timing worked. Oh, melting the butter? That took maybe 3 minutes. Longer and I think the butter would have begun to brown a bit which wouldn’t have been a bad thing. The 9-by-13-inch baking dish was rather large for the fruit I had. In the future I’d use a smaller one. 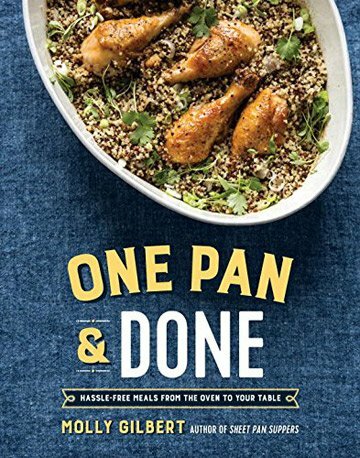 The liquid in the pan was very “juicy” when removed from the oven and I was expecting it to be more syrupy so I removed the fruit from the pan and reduced the liquid to a point that I felt was appropriate—not too thick but certainly not watery. As tasty as the recipe was, one thing didn’t work for us; The skin on the nectarines was difficult to cut and so it slid off the fruit in one piece and was just annoying. In the future I would just cut the fruit into pieces and not have to worry about trying to make halves and remove the stone without ruining the fruit and not have the pesky skin to deal with. But, as I often remind myself, if that’s the biggest problem I have to deal with, I’m a very lucky person! Another easy summer recipe that was a perfect ending to a classic summer barbecue. I served mine with a whipped cream to which I added a little cinnamon. Delicious! This time of year when stone fruit is super ripe and hard to resist, this delectable baked nectarines with port recipe is the perfect way to showcase the juicy gems. I always have a bottle of tawny port (Graham's 10-year old Tawny port) on hand in the liquor cabinet. The rich, inherent flavor gets a bit syrupy in the hot oven, and almost takes on a caramel flavor when cooked with the melted butter, honey, nutmeg and pinch of salt. The halved nectarines absorbed the flavors of the port mixture and also got super tender in the hot oven. I adored the results of this summertime recipe and would love to try it with a mixture of stone fruits next time, all cooking in the same pan. I served this with a scoop of vanilla bean ice cream which was a lovely pairing. I think a dollop of vanilla creme fraiche or even mascarpone would also be fabulous. This dessert makes you feel fancy. I can imagine it being served at a Queen's table in the Renaissance. Be sure your nectarines are succulently ripe and flavorful as it will enhance this dessert. I chose a ruby port which along with the butter, honey, and nutmeg seeped into the tender flesh of the fruit. I crowned the nectarine halves with rich cinnamon ice cream which pooled and beribboned the warm flesh of the fruit. I also added a few toasted pecans which provided a pleasant crunch. These baked nectarines with port were an elegant ending to my dinner party and were both easy and sumptuous. This baked nectarines with port recipe is a perfect summer dessert—fast enough for a weeknight and elegant enough for company. My nectarines may have been on the small side, but I'd definitely watch the cooking time. Mine were beginning to "release some of their juices" in 20 minutes. They were tender when pierced with a sharp knife and would've been falling apart if they'd baked 30 minutes. I had 4 servings and topped the nectarines with vanilla bean ice cream. The color would change some, but I think peaches could be done the same way. Yum! I’m giving this a 10 based on taste, ease of preparation, and the fact that even someone who doesn’t have access to the best fruit, can end up with an amazing dish. Wanting to serve just the 2 of us, not 4 to 6 people, I cut this recipe in half. After practically inhaling the nectarines, and drinking up all of the liquid in my casserole, I was sorry that I hadn’t made the entire recipe. The good news is that this is so very, very quick and easy to make, that I can have these at any time my heart desires. I actually tried the recipe again, using nectarines from a vendor whose fruit is not my favorite. I wanted to see what it might be like for folks who only have access to, for example, supermarket produce. The butter, the port, the honey, and the nutmeg made up for anything that might have been lacking in the fruit. Again, it was delicious. I liked the taste of the fruit so much, that I ate most of my nectarines without any topping. The sauce was wonderful enough. I did try one with just some heavy cream poured over the top, not even whipped. Not necessary, but very good indeed. 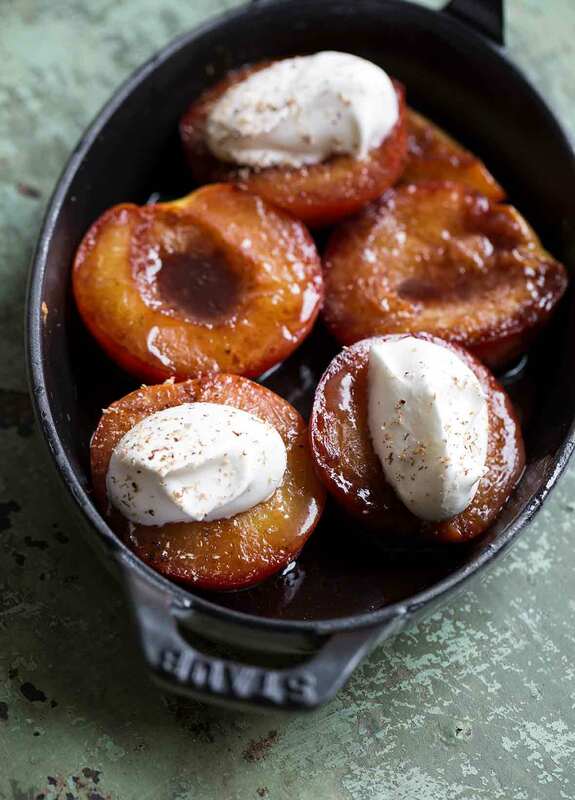 Baked Nectarines With Port Recipe © 2017 Molly Gilbert. Photo © 2017 Aran Goyoaga. All rights reserved. All recipes and photos used with permission of the publisher. I have a deal with a local farmer; at the end of the market he gives me crates of bruised fruit, in return for me bringing him something tasty the next week. I make a simpler version of this recipe; I simply cut up big chunks of plum, (peeled) peaches, apples, or pears into a big pyrex roasting pan, toss in several pieces of crystallized ginger diced small, two or three cinnamon sticks, several whole cloves, and maybe some mace, sprinkle maybe half a cup of sugar over all, then pour in wine up to the fruit’s shoulders. White zinf works well, as does port, marsala, even sherry. This goes in the oven at 200 degrees for four or five hours, uncovered. The fruit carmelizes, the liquid turns to syrup, and the house smells heavenly. Some we eat as is, some becomes the floor for a fruit upside down cake or a granola crumble, some gets put up in pint jars for midwinter. Lynn T., I absolutely love your arrangement with your farmer! What an inspired idea. Thanks so much for sharing both your recipe and your bartering situation. Thank you for posting this recipe! It was astoundingly simple and simply astounding. The flavor combination of the honey, nutmeg, port, and fruit was so much greater than the sum of its few parts. And it does feel Medieval, somehow. My nectarines only took 15 minutes to get spoon soft, and I think I’ll try a last-minute squeeze of lemon to balance, next time, and/or as was suggested by a comment, creme fraiche for a tang. I anticipate this becoming a summer dessert staple, especially for my (miserable) friends and family who are eschewing wheat and white sugar…if I can bear to share it, that is.